At the end of Yarramalong Valley, the track rises to Walkers Ridge through pristine rainforests and tall timber along the ridges. Further north there is an excellent view of the southern side of Mt Warrawalong and then some excellent views down Watagan Creek Valley. Another climb takes the track up onto Cabans Ridge with some great views down into the farm-filled Congewai Valley surrounded by Blackbutt forests. Once again the track descends and follows the road through this beautiful valley rimmed by the surrounding forest ranges. At “Brownmuir” the track leaves the fertile valley behind and heads up to Georges Road to run along the southern rim of the Hunter Valley. The views across the green chequerboard on this broad river flat to the distant blue ranges of the Barrington Tops are extraordinary while the sunset views from Hunter Lookout are amazing! Here the track leaves the fire trails and drops down below the cliff line through vine-strung rainforest and past green mossy pools to Heatons Lookout with its stunning views across Lake Macquarie to the distant Tasman Sea. On the eastern side of Heatons Gap more views unfold this time of the townships strung along the northern rim of Lake Macquarie while to the north-east Newcastle appears. 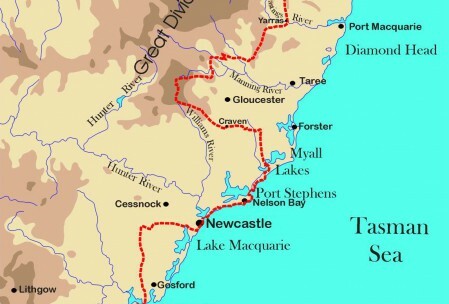 Fire trails and back roads take the track to Teralba and along the northern edge of Lake Macquarie before running through the southern suburbs of Newcastle to reach the coast at Glenrock State Recreation Area. Here the Great North Walk runs north through the coastal reserve past Merewether Beach and Bar Beach to Queens Wharf, a vibrant, cosmopolitan venue on a sunny day. The ferry ride across the Hunter River is eventful as coal carriers wind in and out of the port. 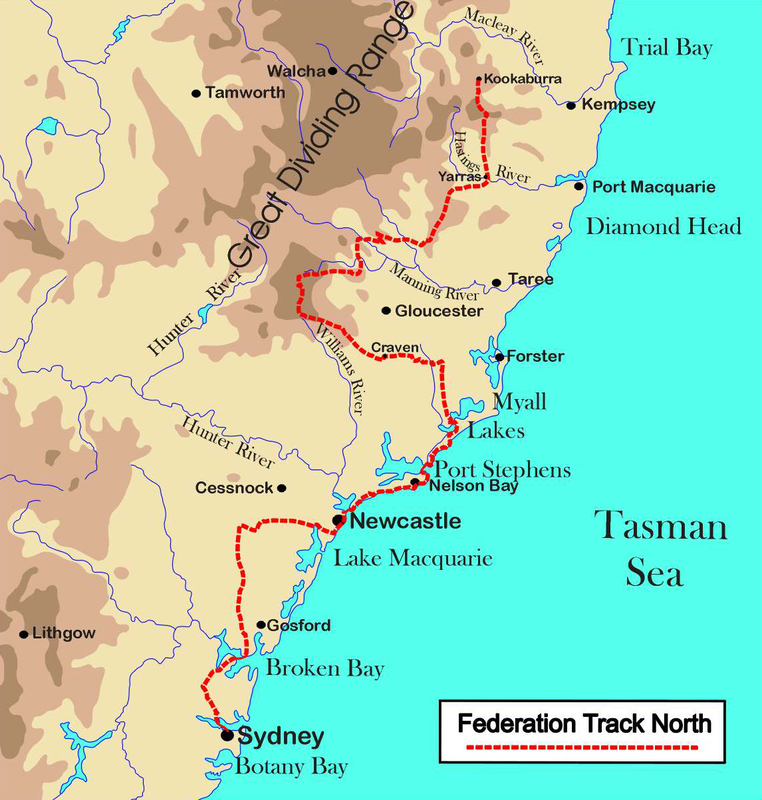 At Stockton the Federation Track follows the long golden arc of Stockton Bight past the wreck of the “Sigma” before crossing coastal dune to follow 4WD tracks through the sand dunes and swales of the Tomago Sandbeds to the rocky shoreline of Anna Bay. The track then follows footpads and more 4WD tracks along the picturesque coves and headlands to Morna Point with its wonderful wildflowers. More beach walking follows to the tracks along the extraordinary coastline of Tomaree National Park to Fingal Bay where the track follows a walk/cycle path and then more footpads to reach the stunning views from Stephens Peak and Tomaree Head before winding along the edge of Port Stephens to Nelson Bay.